These wooden garden storage boxes provide more options than just storing garden cushions. Designed to the highest spec these stylish outdoor wooden storage boxes offer a great way to compliment your garden furnishings keeping your outdoor space tidy and refreshing at the same time. 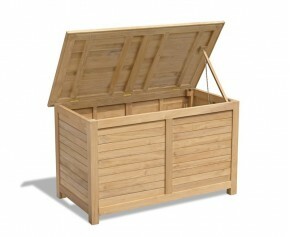 Choose from our range of garden storage boxes with lids here. Our great value large teak storage box is expertly manufactured from smooth sanded plantation teak for long life and aesthetic appeal. Perfect for your garden, patio or pool side to store cushions, towels or garden toys, this large teak storage box can be left outdoors all year round. 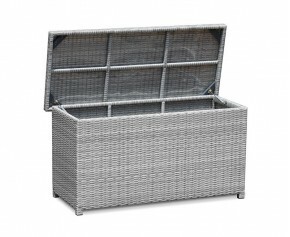 A charming addition in any indoor or outdoor setting, this rattan garden storage box offers a great way of complementing your garden furniture, whilst keeping your outdoor space tidy and refreshing at the same time. Expertly manufactured in synthetic Rehau Raucord® rattan for long life, UV resistance and aesthetic appeal. 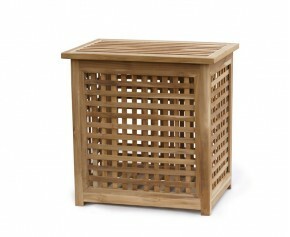 Our extra large wooden Teak Garden Storage Box is made from smooth sanded plantation teak. 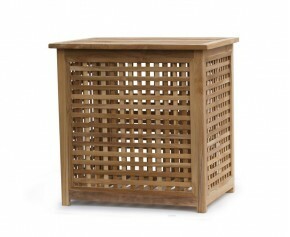 The storage box is perfect for your garden, patio or pool side to store garden toys. 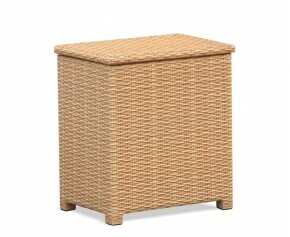 This rattan garden storage box with lid is ideal for storing garden tools, children's toys or even wellies, and offers numerous options for indoor or outdoor storage, representing excellent value.